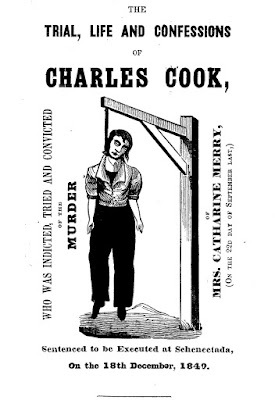 Murder by Gaslight: Charley Cook. The afternoon of September 22, 1840, Polly Cornell was surprised to see her niece and nephew running toward her house crying. The girl, about six years old, and the boy about four were the children of her sister Catherine who lived with her husband Eli Merry, on a farm in Glenville, New York, not far from her own. They told their aunt that Charley Cook, a laborer at the farm, had killed their mother. She took the children and hurried to the house of another relative, Peleg Cornell who sent his son for more help. They all met at the Merrys’ house, and when no one answered their knock on the kitchen door, they went inside. They found Catherine Merry in the cellar, lying on the floor with her throat cut. She had been beaten as well, and her clothes were in disarray. By now several other people had arrived at the house, and they carried the body upstairs to the kitchen. On the kitchen table, they a found shoemaker’s knife with a four-inch blade; on it were blood and hairs. John Miller and John Van Patten saw Charley Cook at Norton’s tavern on the Mohawk turnpike, at about 3:00, before either of them had learned of the murder. He had spots of blood on his face, and when asked about it Cook said he must have had a bloody nose. He washed his face, had a drink and told the men he was planning to take a train going west. Not long after that, four men arrived at the tavern, arrested Cook and took him to jail. He said he has been working in the field that day and around noon went back to the house for dinner. Mr. Merry had left the farm early that morning for some business in Galway, so it was just Charley Cook and Mrs. Merry in the kitchen. Cook said that Mrs. Merry came near him and made improper advances. She did it three times then went down into the cellar. He followed after her, and when he was in the cellar, she turned around and said, “Now I’ve got you where I wanted you; now I’ll fix you.” Then he told the jailers that he thought he would fix her, and he cut her throat. He said he thought he had done right and looked at the jailers as if appealing for approval. Under the same circumstances he would do it again, he said. 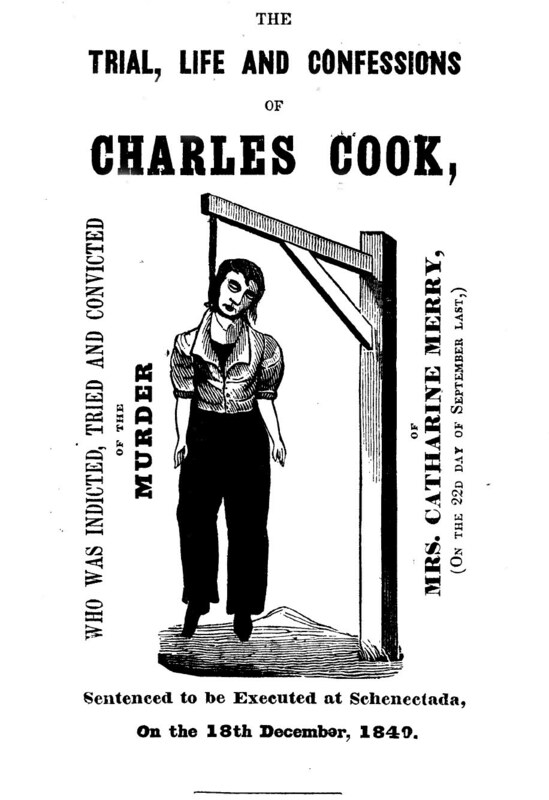 The trial of Charles Cook for the murder of Mrs. Catherine Merry began on October 22, 1840. 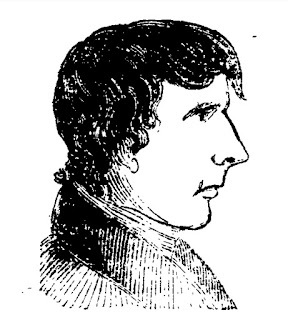 Against the objection of Cook’s attorney, Edward Walton was allowed to testify to Cook’s jailhouse confession, though no one had thought to write it down. It did not matter; the defense did not deny that Cook had committed the murder, they contended that he was innocent by reason of insanity. There was ample reason to question Charley Cook’s sanity. The previous March, before he went to work for the Merrys, he was subject to bouts of extreme melancholy and would moan and make strange noises at night. Those around him were so concerned that they took him to see Dr. Edward A. Young. Dr. Young examined Cook and after taking his pulse found that he was in a considerable state of excitement. He recommended bleeding. Reluctantly Cook agreed to be bled, and the doctor gave him some medicine to take with him. After the bleeding, Cook’s condition seemed to have improved, but later that summer a religious revival came to town and ignited in Cook a new form of mental agitation. He worked himself into a state of extreme religious enthusiasm which first focused on God’s punishment for wickedness but was soon overtaken by emotions of joy and visions of eternal bliss. This culminated with Cook running through the streets of Schenectada (now Schenectady), raving and frenzied,wearing nothing but a blanket, proclaiming himself to be the Savior of the World. When he returned to reason, he found himself in the county jail. The defense brought testimony from doctors as to Cook’s sanity as well as witnesses to his strange behavior. The prosecution countered by pointing out the uncertainty of insanity as well as the ease of deception and simulation. The jury deliberated for thirty minutes before returning a verdict of guilty. The judge sentenced Cook to hang. He kept postponing the wedding until her pregnancy forced him to act. He secretly put poison in her drink, intending to kill the baby, but the dose was too large. “The hand that had so hellishly withered the tender flower had also snapped the parent stem.” He had killed the woman as well. To escape prosecution, he left England for America, but he could not escape the overpowering force of guilt and gloom. Charles Cook was hanged in Schenectada, New York on December 18, 1840. [Mrs. Merry; Charles Cook; Charged], Cabinet, October 27, 1840. “An Execution,” Jeffersonian Republican, December 25, 1840. “Murder,” Cabinet, September 29, 1840. “Murder,” Sun, October 8, 1840. Trial, Life and Confessions of Charles Cook, The (Schemectada: E. M. Packard, Printer., 1840). This happened in my town! I enjoy your stories.